Planning a trip shouldn't be a daunting affair that adds one more issue to tick off your stress list. But with so many things to consider, from the choice of destination to budget management, accommodations, routes, transport, weather, and the daily business back home, it can easily become a nightmare. However, fear not, fellow traveler! Whether you are traveling for business or pleasure, we have just the release for your planning aches: Setapp — the platform that curates the best apps to tick everything for your trip. It's a great way to increase your productivity and save time, without having to waste precious moments in a trial-and-error app search. 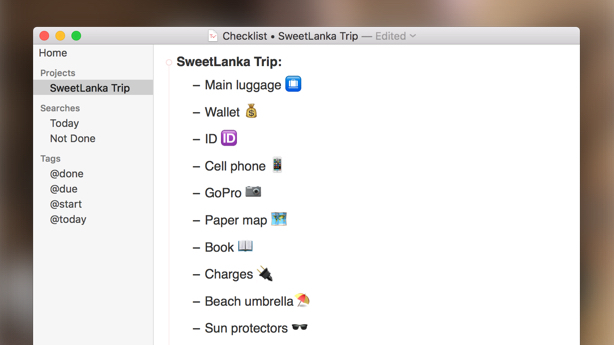 So here it is: trip planning made ridiculously easy! There are countless destinations that ooze wanderlust, so don't be surprised if you find yourself stuck and unable to make a decision. Luckily, for almost everything else nowadays, there's a solution just a few clicks away. To narrow down your options, start by thinking about what activities you want to experience. Do you want a culturally infused trip, filled with museums and attractions, or are you longing for a chill getaway? Answering this question will make it easier to trim down your options. Ideally, you want a destination that is unique and enchanting — something you won’t find anywhere else. Use a combination of LonelyPlanet, TripAdvisor, and well-respected travel blogs for help. Once you have a shortlist, begin gathering recommendations from locals. As good as mainstream travel websites can be, nothing compares to local knowledge. People that call these destinations home are best placed to tell you about the lesser known places to visit: where to eat, where to stay, and where to find culture and entertainment. To help you put all your thoughts in a way that's easier to visualize, Setapp offers iThoughtsX, a mapping app that allows you to transform thoughts into images. With iThoughtsX it's easy to create a simple-to-follow map of all your options, with pros and cons, giving you an overview of all the possibilities. With a destination in mind, it’s time to start thinking about your expectations of the trip: what do you want to do? Are you looking to relax or fill the days with activities? Is a shopping excursion on the cards or do you plan on staying local? Use Setapp’s Merlin Project Express to create and manage your ultimate list of things to do and places to see during your vacation. ‍What things don't you want to miss at any cost? Cross out the places you're not enthusiastic about and voila! You'll have your final list saved safely. Now when you know where you’re going and what you intend to do when you reach your destination, you can begin crunching the numbers. If you want to make the most of your trip, you need to make every minute count. And by that, we mean spending your money wisely. To find out exactly how much a destination costs and get an estimate about how much you should consider spending, keep a close eye on conversion rates. Of course, knowing how many Euros to take with you is just the end result of the deal. To figure out how much you can afford according to your salary and expenses, look back on your monthly spending and decide whether or not you want to dip into your savings account. Don't venture for trips that require more money than you have. At this stage, the trip is really coming together. You know where you want to go and you’ve worked out the finances to afford it. Now it’s time to find somewhere to stay. Picking a hotel in an unfamiliar destination can be a gamble. That's if you don't put in the proper research. Don't be scared by this big word. Research is just part of planning a trip, and with the right advice and tools it can be fast and pleasant. Finding the best accommodation can, and should, be an easy and fun process, allowing you to anticipate how nice it's going to be to embrace the comfort of another country. Check out websites like Booking.com or TripAdvisor to get the best rates and deals for your check-in dates, tailored to your budget. Browse through hundreds of pictures and easily locate the accommodations on an intuitive map, with the possibility of embedding your itinerary to fit your business travel or personal needs. Take your time to imagine yourself there and picture the view from your window. Are you smiling? Then you've found your accommodation. Book it! You’re all set. This trip is happening! There's great joy in anticipation. Actually, half of a trip's happiness comes from looking forward to it. That's why creating your trip route is not only efficient but beneficial to your wellbeing. To craft the itinerary of your dreams, check out the top attractions from your destination. Websites such as LonelyPlanet are a great window to foreign places, capturing their essence in a nutshell. 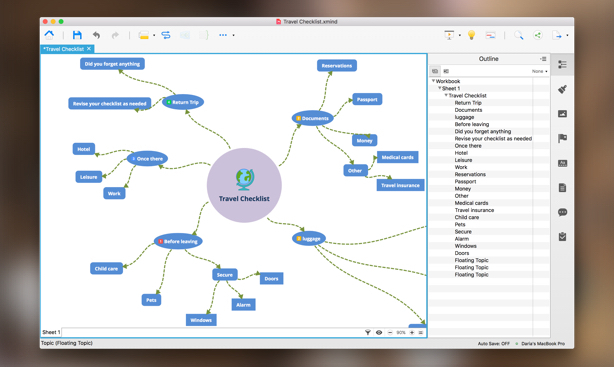 To note all the valuable information down in a way that will make sense to you, Setapp offers another great mind mapping app: XMind. Use it to map all the recommendations and ideas about the experiences you want to have abroad, clustered by proximity, type, or any other way that makes sense to you. 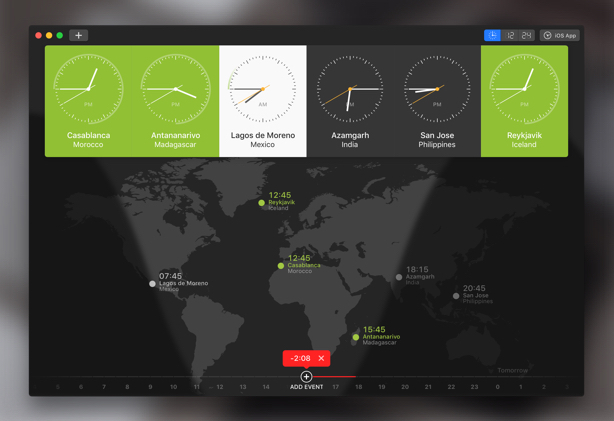 If your route involves traveling through different time zones, use World Clock Pro to keep track of the time at your destination and back home. This way, you can avoid calling up friends and family at 3 o'clock in the morning! Never pack your luggage or leave home without having first checked the weather. Because if it's going to be pouring all the time, that hiking trip might not be such a great idea and you might enjoy yourself more doing some indoor activities. 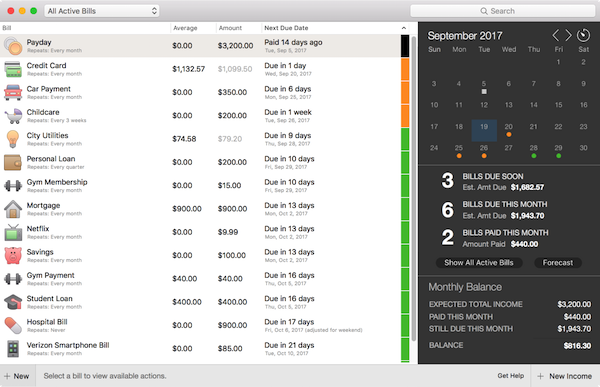 Setapp features Forecast Bar app, which combines a beautiful user interface with hyper-accurate forecasts. Make sure to check Forecast Bar before you leave. With its forecast reaching up to 70 years in the future, you can really plan ahead. And if you want to make some assumptions yourself, the app also takes you 70 years back in the past. Once you get to the destination, stay up to date with the minute-by-minute predictions and be one step ahead of the weather. To use the room in your luggage to the maximum, hit YouTube and look for packing tutorials. You'll find all kinds of hints and tips there. One nice trick is to use reusable compression bags to create more space. Another is to use the inside of the shoes you pack as containers for smaller items such as jewelry. Also, to save more space, you can buy travel-size containers for your toiletries. Don't forget to pack snacks and entertainment for longer flights! 8 - To the airport! Having a close eye on your flight is always a great idea! You wouldn't want to miss out on your vacation at the final stage. Make sure you carefully check your departure time and the time you should get at the airport in order to go through the security check and customs without rushing. Consider the time of day (or night) you're departing and the traffic conditions during those hours. If you plan to take a taxi, make sure to book it in advance. Also, extremely important for departures from big airports: check the terminal you're leaving from! You cannot afford to lose precious time moving across terminals. While we do encourage you to immerse yourself completely in your destination and soak up everything it has to offer, we know life back home cannot always be put on pause. That's why Screens for Mac was invented. Screens is an app that will help you access your files back home, with just a few clicks and a lot of customizable options. While you can't take your home with you, you can definitely keep in touch with your tasks and the people who matter most by connecting remotely with multiple displays. Setapp will make sure you always have the latest Screens updated version, free of ads or distractions, so you can get back to enjoying your lovely trip fast. 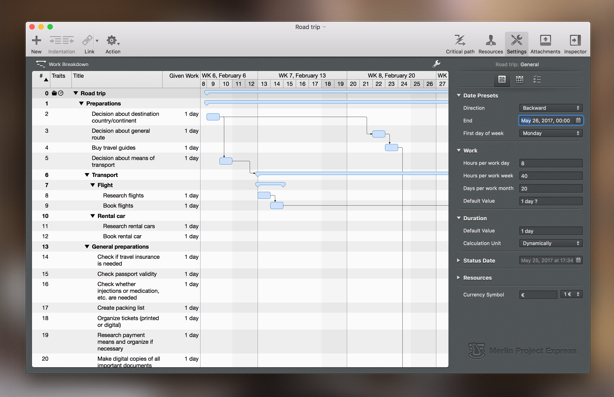 10 – Organize work too! Work is probably the last thing on your mind when you’re sitting on a beach somewhere, but if you’re hit with something that can’t wait, Jump Desktop will give you access to everything you need to complete the task with minimum fuss. What does Jump Desktop do? Exactly what its name suggests: enables you to "jump" to your home desktop and access all the files and necessary data from your home or office computer, regardless of where in the world it may be. For you to be ultra-productive and get back to enjoying your vacation in no time, the app supports multitasking and has a series of stellar functionalities to help you move through tasks with ease. 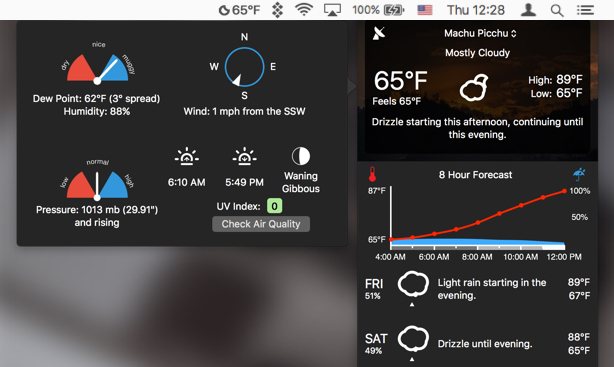 Jump Desktop is tightly integrated into macOS, letting you use Spotlight to launch connections from anywhere with advanced energy saving support. Another trip companion you shouldn't go on vacation without (or spend any day without actually) is Shimo. Shimo is an app that enables you to work remotely through the VPN on your vacation, by following the highest security standards. Choose among a variety of VPN Protocols (OpenVPN, IPSec, PPTP, SSL, AnyConnect, SSH) and enjoy automated connections to get the work done in no time! While English has become the go-to language for travel, there are still a lot of countries in which (don't act so surprised!) it is not widely spoken. And even if it is, a big part of understanding a new culture comes from swirling your tongue to pronounce foreign words. You can learn a lot about people through the phonetics of the language they speak every day. Setapp offers you an app that will help you understand, and speak, the local dialect: Mate Translate. With Mate Translate, you will instantly know if that nice local recommended you turn "left" or "right." With 100 available languages, it guarantees you will never get lost in translation. While you definitely want to be living in the moment during your vacation, we guarantee you'll also want to share the best bits with family and friends. GoodTask will help make sure you don't forget these calls home. Communicating with your loved ones isn't something you'd normally consider a task, but with so much going on during your trip, you might need a timely reminder. Schedule calls home as a checklist on the app and back them with reminders on your calendar. You'll see that having everything organized will make your trip even more enjoyable! Every trip has the potential of opening up new perspectives culturally, personally and even career-wise. Whether you simply want to remember the good times or you have a more complex project regarding your travel adventures, keeping a diary might prove to be an enriching experience. Journey is an app that allows you to make notes, collect info, and write down ideas, feelings, and sweet memories. The app was created with a simple thought in mind: that every experience can be remembered by a feeling. And the more you remember, the happier you can be. Because trips can get pretty busy, the app comes with an intuitive interface that helps you create a habit out of writing your impressions down. The app is highly customizable and supported by robust research at every step. It allows you to use selective sync and makes sure your notes are kept secure. There'll be photo opportunities everywhere along your route. Express your creativity and capture memories in beautiful colors, without any limitation. First, make sure you have enough room on your drive to accommodate all the images. Running low on space? Then Gemini could definitely come in handy. With just a few clicks, it will find any duplicates on your computer and delete them to make more space. Where Setapp also comes to the rescue with a curated app that's perfect for preparing your computer for a journey is AnyTrans. 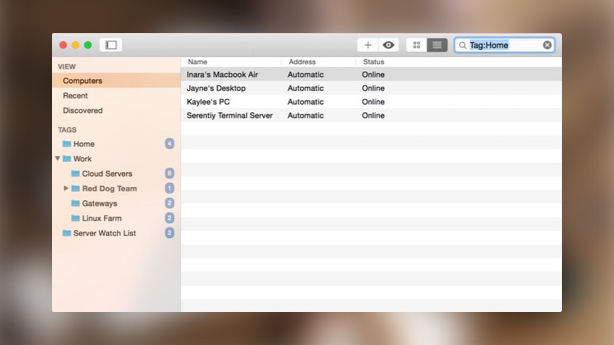 This app might just be the answer to your file management prayers. From transferring files and folders to backup solutions, AnyTrans lets you swipe through the maze of files and media like a pro. Transfer to Mac or clone photos between iPhones – there are no boundaries as to where your files should end up. In fact, you'll find so many picture-worthy places that you might end up with thousands of them. 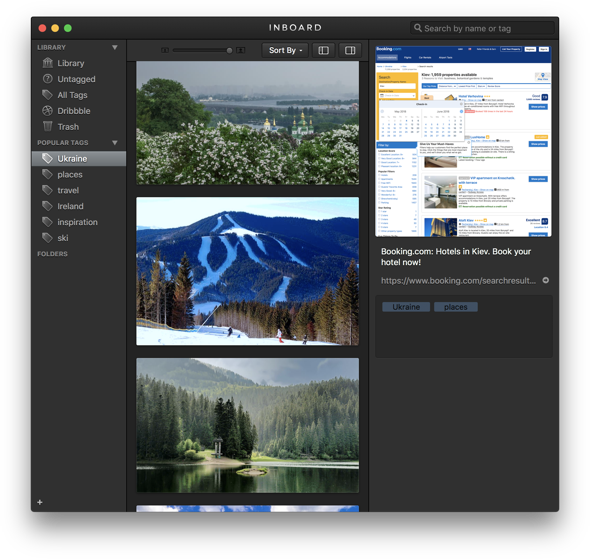 Sort out your photo library with Emulsion, for an easier way to search through your catalog to find the specific photos you're looking for. 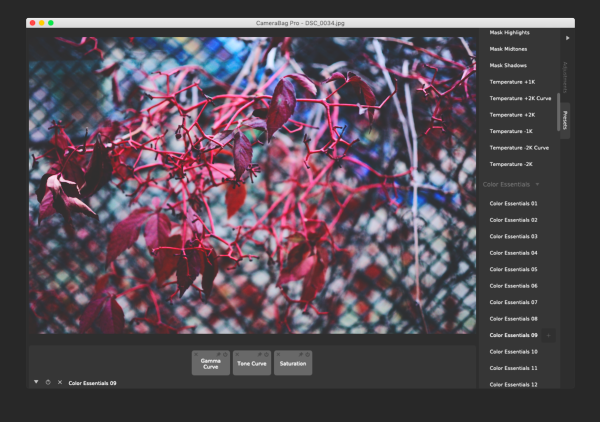 Supporting all the image formats you might need (from psd, ai, svg, jpg, png, tiff, pdf, bmp, gif, ico and many more), Emultion makes organizing easier by auto tagging useful information such as extensions and medatada and keeping pictures in folders, without moving them from their original location. Now you'll have all the resources to keep your memories structured and easy-to-access, at the highest quality available, with just a few clicks. 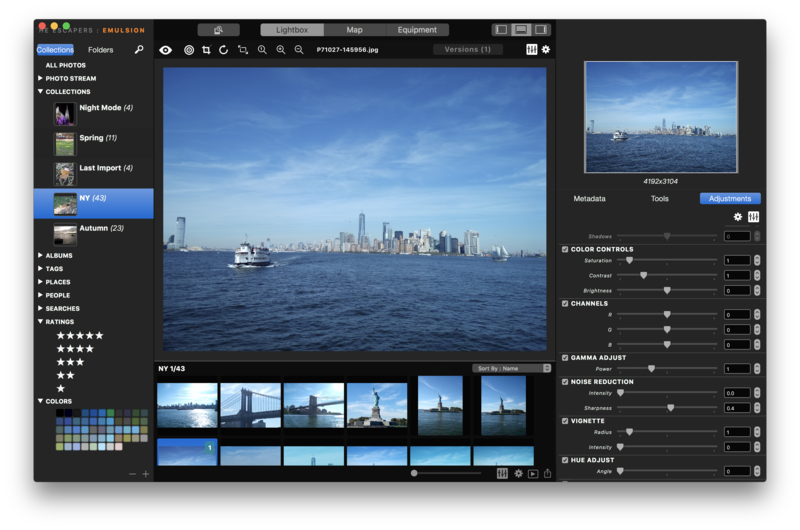 Another great resource for your travel photos (and not only) is the simple yet powerful photo editor - CameraBag Pro. 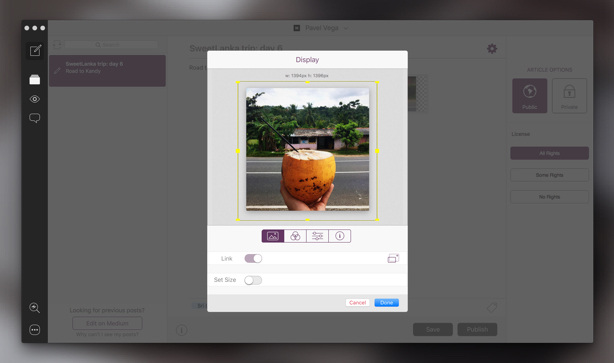 Also curated by Setapp, CameraBag Pro enables you to turn the beautiful sights you photograph into even more stunning photographs. Whether you take photos for pleasure, or you are a professional, CameraBag Pro has a wide range of adjustment options that are intuitive and easy to use. Traveling exposes you to so many new perspectives and experiences that even if you don't run a travel blog, you'll want to make room for a trip related story on your platform. So when you find that perfect angle, make sure you're able to upload it fast with Blogo. Created for the fast-paced 21st-century individual, Blogo transforms the publishing process by simplifying it with enjoyable, yet powerful features. Ideas are hard to come by as it is, so why should blogging add to the headache? Blogo throws away the fluff, allowing you to publish with just a few clicks. The app also lets easily add content from YouTube, Instagram, SoundCloud, Twitter, Dropbox, or any other service or app. When inspiration hits, fire up Blogo to turn ideas into published posts in moments, even offline. So there you have it, the tips and tricks and apps to make your travel planning as easy as possible. 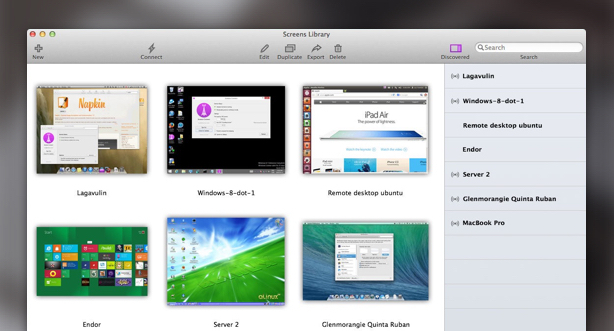 All the above apps work wonders on their own, but under the umbrella of Setapp they can add so much more to your life! 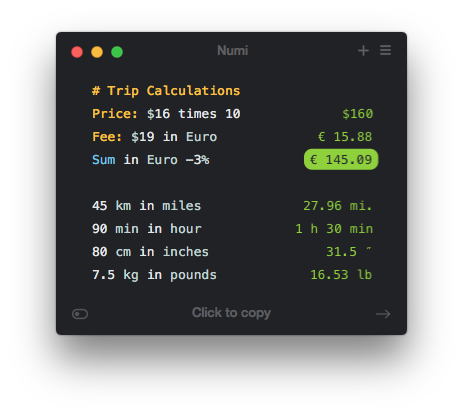 The Setapp subscription service for Mac comes at the price of a transfer from the airport to your hotel. In exchange, it offers convenience and flexibility, with no-in app purchases. That means saving a ton of money, as opposed to purchasing all the above apps individually. What's more, no ads wasting your time! Setapp eliminates the need for managing dozens of passwords or payments, curating the best apps for you to have the trip of your life. It's simple, effective, and fun — just like your vacation should be! Create an account and try out Setapp for free.